Our National Debt Just Hit $22 Trillion. Will Congress Finally Take It Seriously? $22 trillion. Let that huge number sink in. It’s the gross national debt reported Monday by the Treasury Department. The CBO’s latest budget and economic projections estimate that over the next decade the country will add another $12.2 trillion in debt. The national debt is a bipartisan problem. If left unchecked, it will hurt all Americans regardless of race, gender, or political beliefs. The question is, now that we have crossed this inauspicious threshold, will Congress finally get serious about changing the nation’s budget course? For years, the Congressional Budget Office has warned that America’s growing debt is unsustainable, and eventually the repercussions will affect all Americans. Unfortunately, most lawmakers haven’t been paying attention. Instead of implementing reforms to fix the debt problem, Congress largely has ignored it and gone out of its way to avoid making tough budget decisions. The impact of a breathtaking number like $22 trillion is hard to comprehend without context. At more than 107 percent of gross domestic product, as a share of the economy the gross national debt is higher than it has been since 1947. The debt has been higher only three times in U.S. history, all in the immediate aftermath of World War II. If the national debt were divided among every person in the U.S., each of us would owe more than $67,000. Although those numbers are staggering, they are projected to get worse. The CBO’s latest budget and economic projections estimate that over the next decade the country will add another $12.2 trillion in debt. That’s almost $30,000 in new debt per person on top of the $67,000 already owed. That type of reckless spending doesn’t make sense for American families. Why should it for the federal government? The country didn’t find itself $22 trillion in debt over night. The primary factor that has led the federal government to this precarious situation is out-of-control mandatory spending. These so called “autopilot” programs are not subject to the annual appropriations process. Specifically, spending on Social Security, Medicare, and Medicaid is driving much of the government’s long-term spending growth. Discretionary spending also has contributed to the debt problem. The Budget Control Act of 2011 capped discretionary spending from fiscal years 2012 to 2021. However, six times in eight years Congress has modified the caps, with the most recent deal increasing spending by nearly $300 billion. There’s also the issue of more than $250 billion in uncapped disaster and emergency spending that Congress has appropriated since 2013. Much of this funding was used to abuse the caps in the budget law, not for legitimate disaster and emergency needs. And carrying debt doesn’t come cheap. The CBO projects that in the next decade, the amount of money spent on interest payments on the federal debt will rise by 186 percent. In just six years, the country is projected to spend more annually on interest payments than national defense. 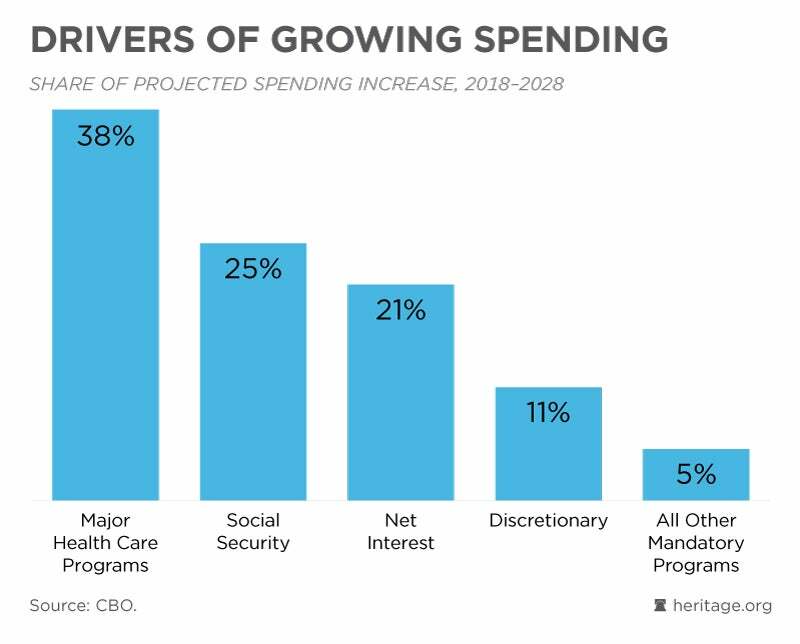 By 2041, the CBO projects, spending on Social Security, health care programs, and interest on the debt will consume all U.S. government revenues. One thing that is not driving debt growth is a lack of tax revenues. Over the next 10 years, tax revenues are projected to be above the 50-year average. But better-than-average revenues simply cannot keep pace with out-of-control spending. If Congress fails to make spending reforms and allows debt to continue to soar, the consequences will be felt by all Americans. Interest rates could rise, wages could go down, and hardworking Americans could see higher taxes and fewer government services. Suffocating national debt could make it harder for most citizens to improve their situation and live their version of the American dream. The good news is that it’s not too late to reverse course and avoid these potentially crippling consequences. The first step for lawmakers should be to put the U.S. budget on a path to balance. This could be achieved through placing a cap on all noninterest spending, with enforcement through the procedure called sequestration. Unlike the Budget Control Act, which protected most entitlement programs from spending cuts, a cap on all noninterest spending would target the entire budget for savings. To avoid sequestration’s indiscriminate cuts, it could spur Congress to make targeted reforms to the programs driving the national debt: entitlements. It is critical that Congress rein in spending and put the national debt on a declining trajectory. As a second step, Congress should reinstate a numerical debt limit. The current suspension of the debt limit expires March 1, meaning that at some point in the coming months Congress will have to address the debt limit. If not, the Treasury Department’s ability to borrow for deficit spending will be constrained. Suspensions of the debt limit mask the true consequences of spending decisions by Congress. Lawmakers should not raise the debt limit without first adopting a plan that controls spending in a way that offsets any increase to the limit and moves toward achieving a balanced budget within 10 years. We will need a strong commitment to fiscal responsibility from lawmakers to dig the country out of this hole. But at $22 trillion in debt and climbing, the consequences of not doing anything would be disastrous. Congress should pay attention to, and act on, this dubious budget milestone.